Are you looking for the protection of storm panels but don’t want to be left in the dark? Storm Guard Solutions offers the security of clear storm panels, also known as polycarbonate panels for your home or commercial property. Your home or business is your most valuable asset. When living in Ava Maria, it’s not a question of IF we will be subjected to intense storms or hurricanes, it’s more a question of WHEN. Protect your home or business by investing in clear storm panels. The experts at Storm Guard Solutions offers installation, service and repair for clear storm panels in Ava Maria. 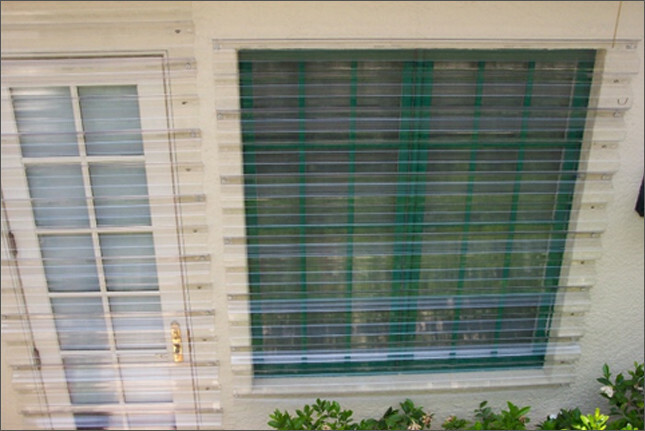 We are here to serve you and provide quality hurricane shutter systems so that your home or business is ready to protect you, your family and your belongings in the event of a hurricane or tropical storm. Storm Guard Solutions is a Naples based, family owned and operated company that has provided leading edge hurricane protection and service since 2004. Stay out of the dark with our clear polycarbonate storm panels. Old metal panels leave the interior of your home dark and are very heavy and hard to install. When you choose our clear polycarbonate storm panels you will love the way our panels are optically clear which allows light to enter your home so that you are not left in the dark when the power goes out and the sun goes down. Our panels are also light weight making it easier to install than other types of panels. Clear polycarbonate storm panels perform many functions. First and foremost, clear storm panels protect your home from any flying debris during a high wind storm or hurricane. Without the protection of storm panels your home is left prone to damages should a hurricane occur. If the wind should cause objcts to become airborne, the windows of your home or business can become damaged allowing water and wind to enter your home. If the wind enters your home, there is a chance that your roof may also be blown off leaving the property utterly devastated. Keep your family and property safe and secure with our clear polycarbonate storm panels. The time to invest in this protection is now, before the next hurricane gets named. Stay safe and be smart. Call Storm Guard Solutions today. Our Clear Polycarbonate Storm Panels are Strong, Simple and Affordable! !